The Samsung Galaxy C8 was launched in September 2017. The phone’s display is 5.5-inches Super AMOLED, Always-on with a full HD 1080p resolution, and Corning Gorilla Glass. It is run by an Octa-core processor with 2.39 GHz clock speed. Samsung Galaxy C8 dimensions are 152.4 x 74.7 x 7.9 mm, and it weighs 180 grams. Samsung Galaxy C8 has a dual rear camera of 13 MP + 5 MP, while the front camera is 16 MP. The 13 MP coloured lens comes with ƒ/1.7 aperture, while the 5MP sensor is a monochrome one with f/1.9 aperture. Other features include LED, and auto-focus. The front 16MP shooter has a f/1.9 aperture with LED flash. The phone comes with the new Bixby voice-assistant page. Samsung Galaxy C8 will let users take portraits with the depth effect. The Galaxy C8 also comes with a facial recognition scanner for unlocking the smartphone. There’s also a fingerprint scanner on the back. The storage options available are of 3 GB RAM + 32 GB ROM and 4 GB RAM and 64 GB ROM. The Samsung Galaxy C8 will provide expandable memory of up to 256GB on microSD Card support. There’s a 3000mAh non-removable battery. 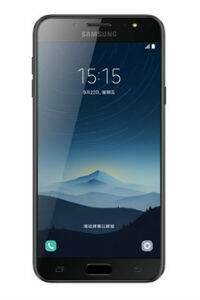 The Samsung Galaxy C8 provides various sensors like accelerometer, fingerprint reader, gyro sensor, geomagnetic, RGB light sensor, and proximity.